A new drop-in center will open up for the region's homeless youth. 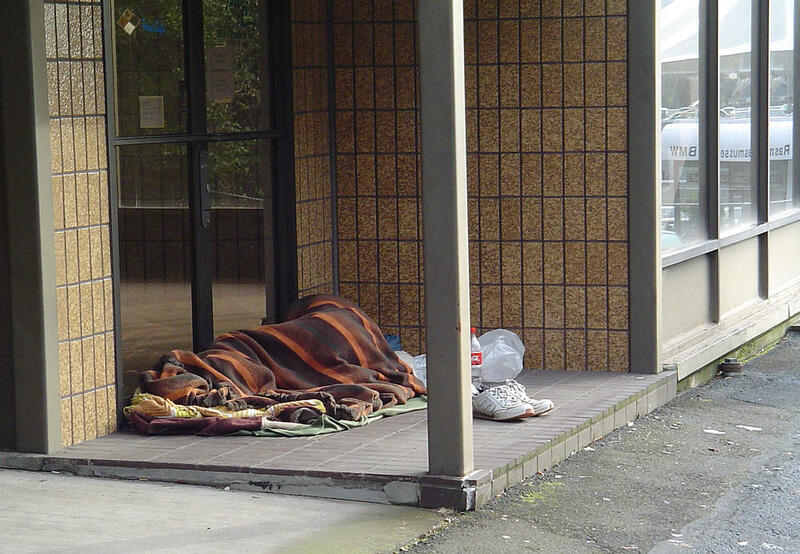 In this photo, a homeless person sleeps in Portland, Ore. Homeless teenagers and young adults in Pittsburgh will soon have a drop-in center that will address a wide array of their needs. The center will be called “412 Youth Zone” and will be targeted at youths between 16 and 24 years old, who are aging out of the foster care system. It will be located downtown in the Wood Street Commons building. Local family agency Auberle will run the center and partner with other local agencies. They expect to serve about 1,500 young adults a year – that’s how many age out of the system. Bill Wolfe, director of The Homeless Children’s Education Fund said the name was picked by some of the homeless youths who will have the opportunity to use it and they've been consulting on the décor. The center will be partially open by the end of December. John Lydon, executive director of Auberle said it will be a one-stop center for services such as workforce skills training, health services and laundry facilities. “It will provide services, it will provide fun and most importantly it will provide a place where youth feel they can belong,” said Lydon. Allegheny County’s Department of Human Services (DHS) visited similar centers in New York City and Philadelphia before setting up this one. Abigail Horn, senior advisor for DHS, said one of their initiatives in the past year has been working to raise services for homeless youth to extend to age 24. Lydon said that extension has been important – parents typically don’t stop helping children once they hit 18 or 21 – and for those who rely on services, she said they shouldn’t be cut off either. Talking to your baby could be one of the best things a parent can do developmentally, and to help get that idea across Allegheny County the Department of Human Services has launched what it is calling the “Use Your Words” campaign. The campaign encourages parents to talk to their infant about things that they are doing. For instance “I am cutting up orange carrots” in an expressive manner is the best way to help children develop. According to 2010 census data, 7.5 percent of Penn Hills residents live below the federal poverty line. That’s about a third of the rate in Pittsburgh, and a little more than half of the rate in Pennsylvania as a whole. In McKees Rocks, on the other hand, more than a quarter of residents live below the poverty line. Based on that data, one might conclude that county services like summer food programs and job training should be concentrated in and around McKees Rocks and not in Penn Hills. A transitional housing and services program for those left homeless by domestic violence is accusing Allegheny County of withholding more than half a million dollars in federal funding. Shaler Township-based HEARTH has filed suit in federal court, seeking to force the county Department of Human Services to release the U.S. Housing and Urban Development funds. HEARTH Executive Director Judith Eakin said DHS is solely responsible for the hold up; HUD has agreed to support the organization’s designation as a victims’ service provider. Jon Potter, the owner of what's said to be Pittsburgh's only hostel, is trying to fund his next big project. A co-operatively owned house called the Pittsburgh Home, it would offer a safe and free place for Pittsburghers in need of shelter. He explains where things stand with the project's development and how a co-operative shelter would work.